Line drawing of branch with flowers and fruits by M. Szent Ivany, J. Adelaide Bot. Gards 4 (1981). 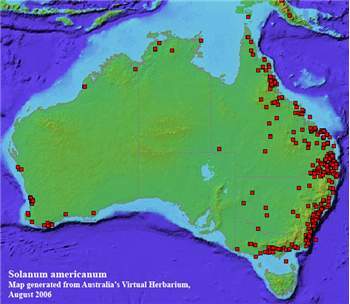 Distribution map generated from Australia's Virtual Herbarium. For a more up to date map visit the AVH site through your local herbarium. 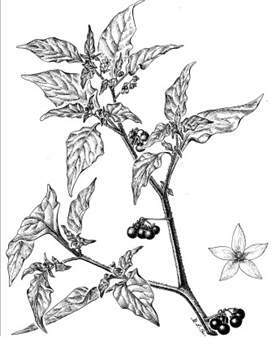 T: Cultivated Chelsea Physic Garden, origin Virginia, North America, Miller s.n. ; lecto: BM, fide J.M. Edmonds, J. Arnold Arbor. 52: 634 (1971), photo AD. S. nodiflorum Jacq., Collectanea 2: 288 (1789) & Icon. Pl. Rar. 2: 11; t. 326 (1789). T: Cultivated Vienna, origin Mauritius, Herb. Jacquin; lecto: BM, fide R.J.F. Henderson, Contr. Queensland Herb. 16: 28 (1974). S. nodiflorum subsp. nutans R. Henderson, Contr. Queensland Herb. 16: 30; t. 2 (1974). T: Indooroopilly, Qld, Apr. 1969, R.J.F. Henderson 518; holo: BRI 86633; iso: K, MEL, NSW. Erect or spreading herb or short-lived perennial shrub to 1.3 m, glabrous or sparsely pubescent with simple hairs, green or the stems and leaves often purplish; prickles absent. Stems often angled or narrowly winged. Leaves ovate or ovate-lanceolate; lamina 2–12 cm long, 1–7 cm wide, concolorous, entire or shallowly lobed; petiole 1–4 (occasionally to 9) cm long. Inflorescence short, 4–12–flowered; peduncle to 25 mm long, lengthening to 45 mm in fruit; pedicels 5–8 mm long. Calyx 1–2 mm long; lobes rounded, 0.4–1.2 mm long. Corolla deeply incised, usually 8–9 mm diam., white or flushed purple with yellow-green centre. Anthers 1.5–2 mm long. Berry globular, 6–9 mm diam., purple-black. Seeds 1–1.5 mm long, light fawn or purplish; stone-cell granules, if present, c. 0.5 mm diam. n=12. A variable cosmopolitan weed in tropical and warm temperate regions. Usually grows in disturbed habitats associated with human activities. Occurs mainly in coastal areas of eastern Qld and N.S.W., where possibly indigenous or of pre-European introduction, and in scattered localities in Vic., W.A. and N.T. where naturalised from later introductions. Also on Lord Howe Is. The species can be difficult to distinguish. Other species to occur in Australia are S. chenopodioides, S. douglasii, S. furcatum, S. nigrum, S. opacum, S. physalifolium, S. retroflexum, S. sarrachoides, S. scabrum and S. villosum. There has been some disagreement as to the correct name for this species; it was previously called S. nodiflorum Jacq. in much Australian literature - recent work using African material has shown that their material under this name is deserving of species status. This species is extremely widespread throughout warm temperate and tropical areas. In Africa, New Guinea and Oceania the young green shoots are cooked and eaten as greens. W.A. : South Perth, R.D. Royce 8408 (PERTH). N.T. : Adelaide River, 22 Nov. 1972, J. Holmes (DNA, NT). Qld: Belmont, S.L. Everist 5606 (BRI). N.S.W. : Kogarah, E.F. Constable 5633 (NSW). Vic. : E of Marlo, 7 Feb. 1972, J.H. Willis (MEL). Further information and images of this species in NSW can be seen on the PlantNET site for WA on the FloraBase site and for SA on the eFlora site. Work on African material using AFLP markers has supported the recognition of a separate species for material previously treated under either S. americanum or as a separate species, S. nodiflorum.